Members of this family adopt a structure consisting of a small globular all-beta-domain, with a three-stranded beta-sheet and a contiguous beta-hairpin. They bind to Mago alpha-helices via extensive electrostatic interactions and at a beta2-beta3 loop via hydrophobic interactions PMID:14968132. 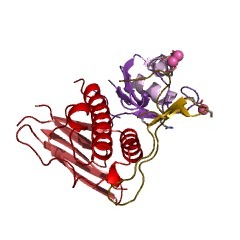 Partner of Y14 and mago (PYM, also known as WIBG) is a key regulator of the exon junction complex (EJC), a multiprotein complex that associates immediately upstream of the exon-exon junction on mRNAs and serves as a positional landmarks for the intron exon structure of genes and directs post-transcriptional processes in the cytoplasm such as mRNA export, nonsense-mediated mRNA decay (NMD) or translation [(PUBMED:18026120), (PUBMED:19410547)]. The N-terminal domain of PYM adopts a small globular all-beta-domain structure, with a three-stranded beta-sheet and a contiguous beta-hairpin. It binds to both Mago and Y14 [(PUBMED:14968132)]. There are 1405 Mago-bind domains in 1383 proteins in SMART's nrdb database. Taxonomic distribution of proteins containing Mago-bind domain. This tree includes only several representative species. The complete taxonomic breakdown of all proteins with Mago-bind domain is also avaliable. Click on the protein counts, or double click on taxonomic names to display all proteins containing Mago-bind domain in the selected taxonomic class.